A united opposition in Parliament rejected Trade Minister Trond Giske’s explanation of how and why he behaved as he did when he actively tried to halt the sale of Norway’s largest commercial television station TV2 to a Danish company. Giske made few if any apologies, and that sparked calls to send the case on to the Parliament’s committee that could cite Giske for not doing his job. Giske contends he was just doing his job, when he tried to stop the sale of media company A-pressen’s 50 percent stake in TV2 to Egmont of Denmark, which also held 50 percent. A-pressen in turn is owned by trade union confederation LO and telecoms firm Telenor, in which the state maintains a major stake. It was through this stake that Giske tried to exert his influence as major shareholder. And he did, to a degree that stunned officials at both LO and Telenor. Giske fired off text messages, held impromptu meetings at the annual meeting of employers’ organization NHO and even kept pushing his cause at a late-night session at the Oslo bar and restaurant Lorry’s. Political intrigue ran high, and the leaders of both LO and Telenor felt they were being put under extraordinary, unwarranted pressure. They were also puzzled, because Prime Minister Jens Stoltenberg kept saying that the government “had no opinion” on the sale of TV2 and no plans to interfere. Giske then got in trouble for going behind Stoltenberg’s back and seeming to carry on his campaign with no formal mandate from the government. Giske has claimed all along that he does have support, from within his own Labour Party, from government coalition colleagues Kristin Halvorsen of the Socialist Left (SV) and Liv Signe Navarsete of the Center Party and from county leaders from Labour. The tall trade minister literally kept standing tall, calmly and cooly fending off the criticism he was showered with. Late last Friday and through the weekend, though, things got worse, after a clearly fed-up Telenor chairman Harald Norvik, himself a Labour Party veteran, held a highly unusual press conference to complain about Giske’s heavy lobbying and claim that he was put under pressure “that was entirely incorrect for a government minister to exert.” Included within the pressure were “rumors” that Giske would replace him as Telenor chairman if the TV2 sale went through. Norvik and many others also believe that Giske violated the terms of his own government policies on state ownership, which hinder meddling in specific business decisions. The state is generally a passive owner, expected to let company boards and management assess what’s best, and other investors don’t appreciate state interference. One local business professor claimed that Giske was using “1970s methods” that simply don’t work anymore. 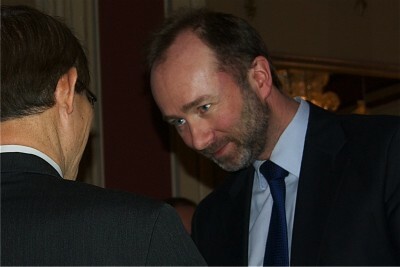 Stoltenberg tried to rein in Giske, without much success, but his irritation with Giske was visible. It wasn’t likely Stoltenberg would fire him though, because that would set off a power struggle within the Labour Party, where Giske has his supporters. Other opposition politicians went so far as to say Giske had lied in his messages to Norvik, implying that the government did in fact have an opinion. Giske would only concede that perhaps one of his text messages was “imprecise,” and the conflict between Giske and Norvik escalated. No reconciliation is in sight, and it poses a problem if the country’s trade minister and the chairman of one of the county’s biggest companies are in conflict. Meanwhile, Giske was called in to Parliament on Thursday and opposition politicians wanted to see a humble and apologetic trade minister. They didn’t. Instead Giske kept defending his attempts to keep ownership of TV2 local. He apologized for a few aspects of how he carried out his attempts, but he claimed he had not exerted “unwarranted pressure against Telenor’s chairman” and can only acknowledge that Norvik thinks he did. Giske also claimed it was “normal” for the ministry to have meetings with the companies in which the state invests, and that the companies inform the state, via the ministry, about important issues. He cited cases where the state can exert active, not passive, ownership. He thought the sale of TV2 was a legitimate issue to take up, and oppose. Opposition parties disagreed and want the case to be heard and evaluated in the parliament’s Standing Committee on Scrutiny and Constitutional Affairs. That’s where committee members evaluate whether rules were followed, and even though the government parties’ majority in Parliament blocked a formal referral to the committee, Norwegian Broadcasting (NRK) reported that the committee is likely to take up the issue on its own. At stake is the role of the state in its ownership of major companies, and whether Giske’s behaviour will scare other investors away.